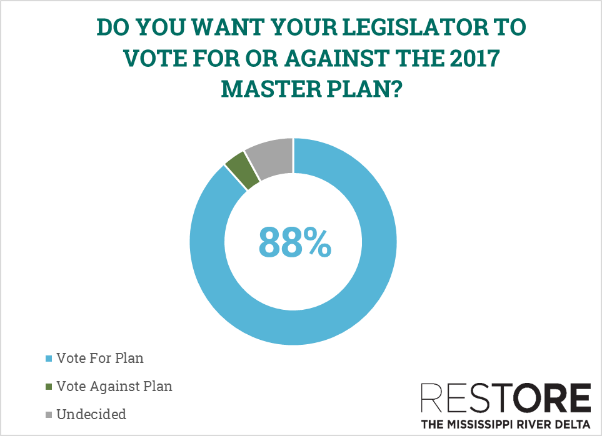 (NEW ORLEANS—April 3, 2017) An overwhelming 88 percent of Louisiana voters want their legislators to vote for the 2017 Coastal Master Plan, according to a new statewide poll released today. The master plan is the state’s science-based blueprint for large-scale restoration and protection of Louisiana’s critical coastal areas. The draft plan will soon be finalized and is expected to be approved by the Coastal Protection and Restoration Authority Board. It will be sent to the state Legislature for passage later this month. 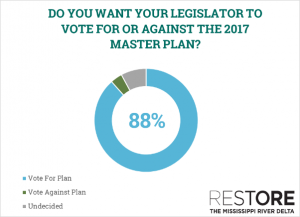 The poll identifies extensive statewide support for the master plan, including 93 percent in the southwest coastal region, 92 percent in the Orleans metro region, 89 percent in the Bayou Central region, 88 percent in Plaquemines and St. Bernard Parishes, and 84 percent in north Louisiana. A majority of Louisiana voters (52 percent) say they will be more likely to vote for their legislator if he/she votes for the plan; only 4 percent would be less likely to do so. 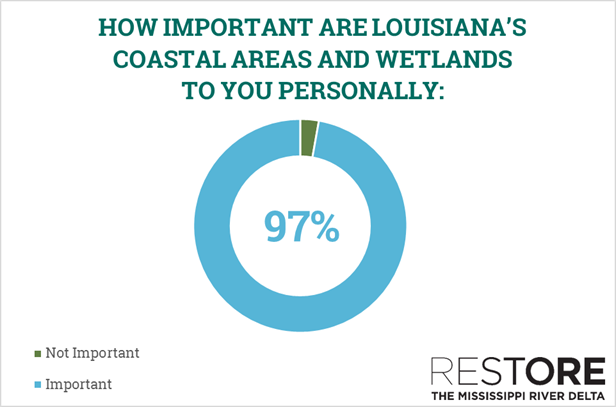 The poll found that 97 percent of voters statewide say that Louisiana’s coastal areas and wetlands are personally important to them. Additionally, 74 percent of voters (87 percent of coastal and 66 percent of non-coastal voters) believe that coastal land loss will affect them personally in the future, and 85 percent believe this land loss poses a “very serious threat” to coastal cities and communities subject to hurricane storm surge. “The future without action presents an unacceptable reality. Louisiana residents have seen the destructive forces of nature first-hand, and every effort must be made to ensure the protection of our culturally and economically important coastal region for generations to come,” continued Cochran. 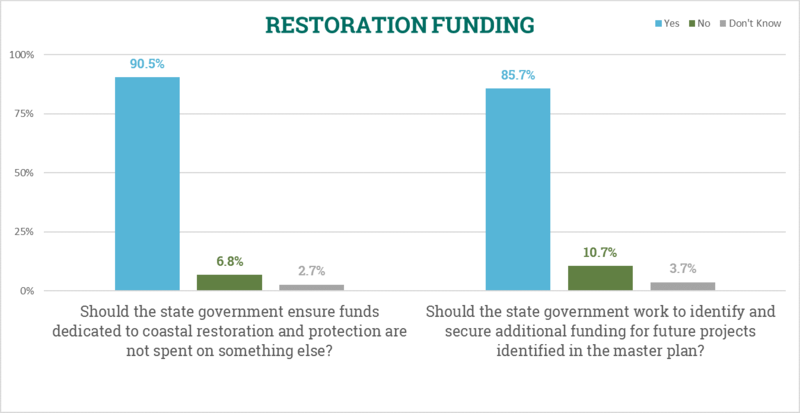 Two-thirds of Louisiana voters (67 percent) also recognize there is currently not enough money available to do all that needs to be done to protect and restore coastal Louisiana, and 86 percent believe the state should identify and secure additional funding for master plan projects. Most voters (91 percent) maintain the opinion that funds dedicated to coastal restoration and protection should not be spent on anything else. About the poll: The statewide Louisiana poll was developed and conducted by Applied Technology Research Corporation for the National Audubon Society on behalf of Restore the Mississippi River Delta. Interviews for this statewide poll were completed by telephone with 1,050 likely Louisiana voters from March 2 through March 8, 2017. The overall sample error for the statewide statistics is not greater than plus or minus 4.0 percentage points at the 95% level of confidence. Restore the Mississippi River Delta is working to protect people, wildlife and jobs by reconnecting the river with its wetlands. As our region faces an ongoing and severe land loss crisis, we offer science-based solutions through a comprehensive approach to restoration. Composed of conservation, policy, science and outreach experts from Environmental Defense Fund, National Audubon Society, the National Wildlife Federation, Coalition to Restore Coastal Louisiana and Lake Pontchartrain Basin Foundation, we are located in New Orleans and Baton Rouge, Louisiana; Washington, D.C.; and around the United States. Learn more at mississippiriverdelta.org.